WOMAN IN BURKA SURROUNDED BY POLICE, THOUGHT TO HAVE BEEN CARRYING BOMB UNDER GETUP……. – The Tundra Tabloids……. 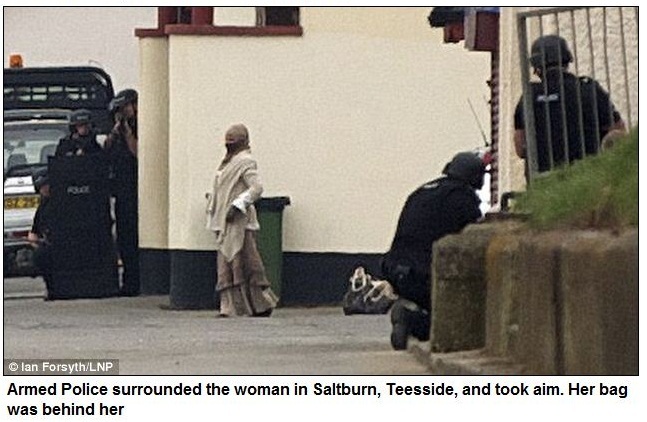 WOMAN IN BURKA SURROUNDED BY POLICE, THOUGHT TO HAVE BEEN CARRYING BOMB UNDER GETUP……. They are (burkas and niqabs) indeed security risks. Dressed in a Muslim veil and surrounded from all angles by armed officers, this was the astonishing scene yesterday as a tranquil seaside resort was plunged into a full-scale terror alert. Scores of officers carrying sub-machine guns and wearing full protective uniform descended on Saltburn-by-the-Sea, near Middlesbrough, at 11am after reports that a woman had a bomb in her bag. During a dramatic stand-off with police negotiators, the woman – said to be local to the area – was ordered to place the rucksack on the ground. NOTE: It’s still unknown whether or not she had explosives. Previous Post Previous Post MSNBC’S ELDER STATESMAN AL SHARPTON UNLEASHED: A HISTORY OF VILE BIGOTED STATEMENTS……..
Next Post Next Post FINNISH WELFARE STATE IN NEED OF 200 000 MORE JOBS TO JUST KEEP AFLOAT……..
Don’t want to be suspected of anything? Don’t walk around in a silly disguise! And who is expected to pay for the expenses involved for eight hours of police, military as well as air and bomb disposal units? Now multiply that cost to address each and every episode these uniformly (pun intended) ‘mentally challenged’ members of this cult potentially present.